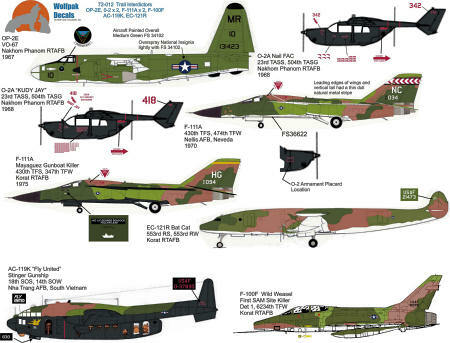 The next sheet in the series is this one on aircraft used against the Ho Chi Minh Trail at some time during the Vietnam war. You would think that it would be easy to control, but the trail was not just a single rouad but a complex of routes that led from North Vietnam through Laos and Cambodia into South Vietnam. Quite a lot of money and material was expended to try to halt the flow of supplies and men, but it was not entirely successful. First up is an OP-2E from VO-67. This short lived unit operated out of Nakhom Phanom in Thailand during 1967. Painted in FS 34102 upper with standard white undersides. Next, there are two O-2As from the 23rd TASS also based at Nakhom Phanom. These are overall matte black and were operating in 1968. The F-111A also got into the act with its modern weapons suite and there are two of them on this sheet. Both are from the 430 TFS at two different times and different air wings. The one with the 474 TFW at Nellis in 1970 has a nice red and white arrow tail band. The other with the 347 TFW at Korat was used during the Mayaguez incident in 1975 (look it up). Getting a bit larger, there is an EC-121R from the 553 RS at Korat. No big antenna housings on this one. An AC-119K is the next aircraft and was operating with the 18th SOS out of Nha Trang in South Vietnam. Underside black on this aircraft. The final option is for an F-100F Wild Weasel with the 6234th TFW at Korat and was the first SAM Site killer in a long list of Weasel-destroyed sites. There are kits for all of these planes, though you may need to do some modifications to match those that are depicted on the sheet. 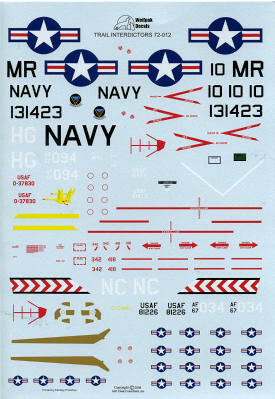 Typical of Wolfpack Decals, the instructions are superlative, providing a history of the planes in question as well as load-out information and any updates or modifications required. If you have not yet treated yourself to some of the best researched decals around, you should.